A School Games National Finals report is here, while coverage of the IAAF Diamond League final in Brussels is here. 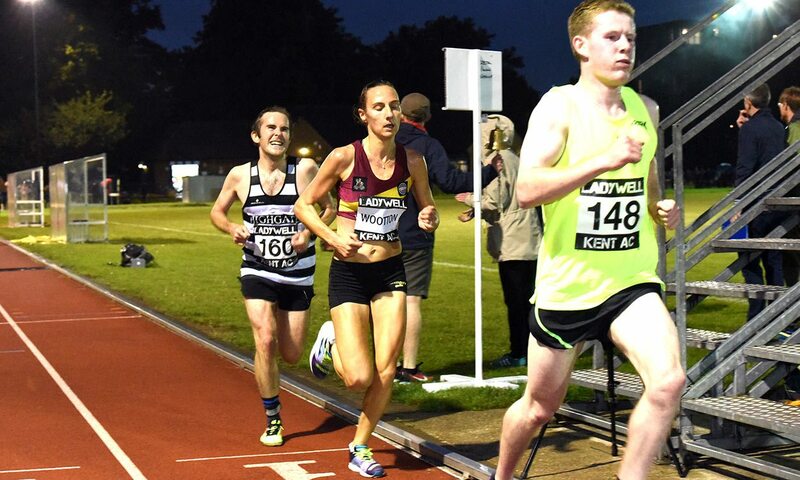 In the inaugural running of this event, which had six races, Katrina Wootton took over 40 seconds off her 10,000m PB to set a UK lead of 31:45.63 to move her from 30th to 11th all-time in the UK. The Coventry Godiva athlete achieved it with even splits of 15:53 and 15:52. She became the 16th Briton to break 32 minutes and runs in this weekend’s Simplyhealth Great North Run. The time would have placed her 14th and third European in the London World Championships 10,000m final. Paul Martelletti won the men’s race in 29:48.41 to go second in the 2017 M35 rankings, while runner-up Nick Torry went top of the M40 rankings with 29:58.39 and becomes the fifth M40 to break the half-hour barrier on the track. Rosie Clarke and Iona Lake ran 3000m steeplechase PBs of 9:32.10 and 9:39.03 respectively, with Clarke’s time moving her to fourth on the UK all-time list. Dina Asher-Smith was second in the 100m in 11.23, while Desiree Henry was fourth in 11.40. Adam Gemili finished fourth in the men’s race in 10.21, while Rabah Yousif was fourth in the 400m in 46.04. Morgan Lake cleared 1.88m for fifth in the high jump, while Andrew Pozzi clocked 13.56 for fifth and David King 13.73 for seventh in the 110m hurdles. Jack Green was fifth in the 400m hurdles, clocking 50.27. Lynsey Sharp was third in the 800m in 1.58.35. Emelia Gorecka ran 9:03.85 for eighth in the 3000m. Dewi Griffiths was a clear winner in 28:48, well clear of former National winner Charlie Hulson (29:59). Griffiths ran splits of 14:26 and 14:22 to come close to his PB. John Beattie was third in 30:17. Lily Partridge won the women’s race in 33:38. Rebecca Hilland was second in 34:18. Mohammad Abu Rezeq won in a time of 30:30. Jackie Fairchild was first woman in 35:02. Wondiye Indelbu was first in 30:52, with Jonny Taylor second in 31:09. The first woman was Gerda Steyn in 36:08. Blackheath and Bromley were overwhelming winners, finishing a whopping 167 points clear of runners-up Shaftesbury Barnet. Ethan Brown won the under-20 400m for them in 48.26 by a hundredth of a second from Matthew Pagan. Katy-Ann McDonald won an under-20 800m and 1500m double. She won the 800m by over 11 seconds in 2:08.22 and the 1500m in 4:40.81. Funminiyi Olajide won the under-17 long jump with 5.61m. Cardiff’s Jay Morse gained an under-17 shot and discus double, the latter with a 52.57m throw. MATCH: 1 Blackheath & Bromley Harriers 994; 2 Shaftesbury Barnet Harriers 827; 3 Team Edinburgh 822; 4 Windsor Slough Eton & Hounslow 684; 5 Team Glasgow 620.5; 6 Kingdom Athletic 619; 7 Rugby & Northampton 602.5; 8 Cardiff AAC 563. Unlike the older age group final the previous day, this was a close affair. Only 7.5 points covered the leading three teams and Sale Harriers Manchester won with 602 points from Blackheath & Bromley’s 599 and Southampton’s 594.5. Andy Robertson won the 100m in 10.31.